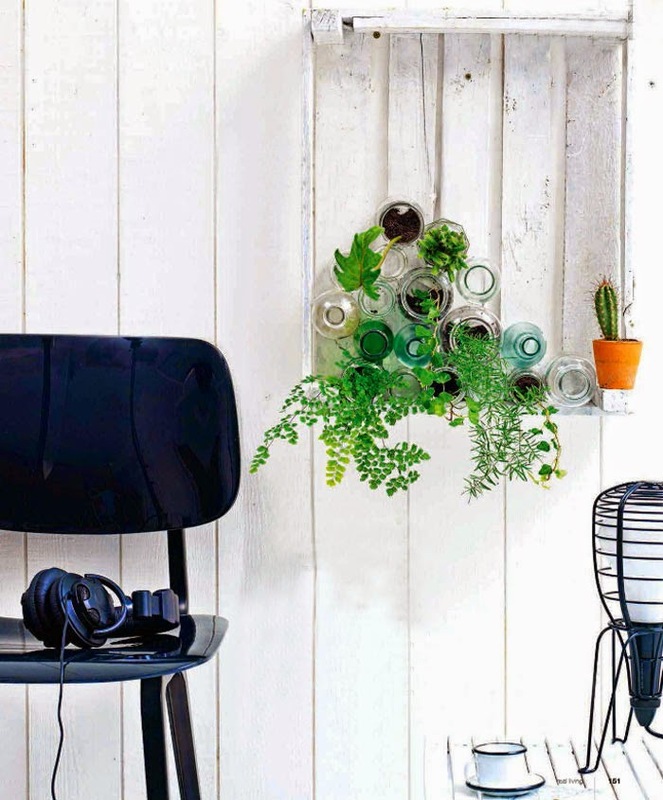 Kicking off the week with this cool decorating trick and a new version of a vertical garden. Stack jars (with plants in them) on their sides (securing them together with strong double-sided tape) and place in a painted crate and hang on the wall! Super easy and so fresh! Would be perfect for an indoor herb garden, don't you think? Styling by Esther Jostmeijer and photo by Louis Lemaire of insidehomepage for Real Living. Happy Monday! coming from the April issue of Real Living Magazine. I was just planning to have vertical garden outside. Going to extend a bit :) my garden. Nice idea! Looks cool and I immediatedly started planning something like this in my kitchen, but then from the practical side - when watering, how would you keep water and soil running out of the wider jars? There's not enough depth, especially for herbs; for succulents only, maybe. Or are there any solutions I haven't thought of?